Much has already been said and written about Plan S, the initiative of a group of European research funders to drastically increase and speed up the transition to full open access. Instead of adding to that with statements on whether it is a good idea or on which elements we like and which we do not like, here we present and dissect eight possible routes towards compliance. For each of those routes the scheme shows examples (please treat them as such), assessments of effects on various stakeholders and on overall cost and also whether the route aligns with expected changes in the evaluation system. In our view it is useful to discern 5 potential gold routes and 3 potential green routes. Using existing or new APC-based gold journals / platforms. Using existing or new non-APC-based gold journals / platforms (a.k.a. diamond). Flipping journals to an APC-based gold model, by publishers or by editors taking the journal with them. ‘Soft-flipping’ journals to APC gold (leaving subscription/hybrid intact): this means creating a APC-based full OA sister journal with same scope, editors, policies etc..
Flipping journals to non-APC-based gold (diamond), by publishers or editors. Archiving the publisher version, on publication, with copyright retained and an open license. Archiving the accepted author manuscript, on publication, with copyright retained and an open license. Sharing preprints (e.g. in dedicated preprint archives) and using overlay journals for peer review. We hope this is valuable in supporting discussions or that it will at least provoke some comments. For the latter you can either use the comments function below, use Hypothesis or use the Google Slides version of the scheme. ← Plan S – response to alternatives proposed by Kamerlin et al. thank you for the scheme, it was very informative. I somewhat struggled with point 11: “fits changes in assessment”. Could you expand on what changes you are refering to? This is a really useful synopsis. I’m not sure I agree with how you have categorised the effect on funders (point 7) for green routes F and G though. You’ve put that there will be ‘no financial gain’ but this is a bit misleading. Typically Funders provide the money for APCs, libraries provide the money for journal subscriptions. 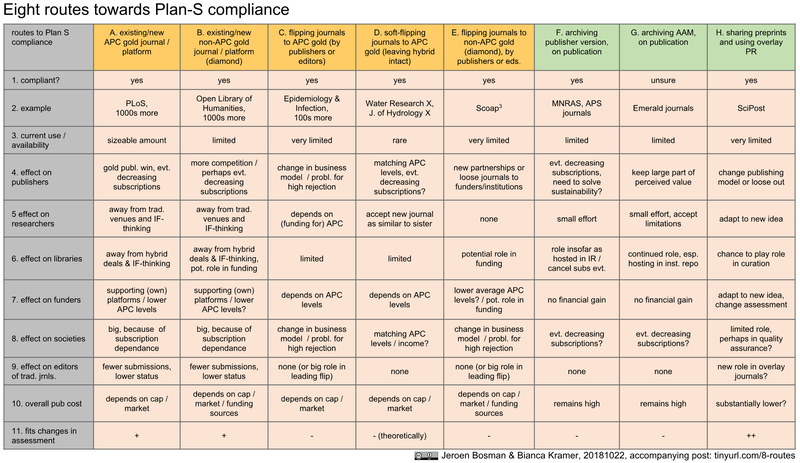 If authors use a subscription journal with a compliant green option, the Funder does not need to provide money to pay for an APC. So while there is no ‘gain’ for a funder from an author using the green route, there is no additional financial outlay which is incurred if the author chooses an open access journal which requires an APC. Thanks for your very useful summary and great work at increasing awareness on all these issues. One little comment/correction: SciPost is often described as an overlay journal, but that’s not correct. SciPost is a completely fully-featured publishing portal, not relying on preprint servers for disseminating the published versions of record. For physics, we do require our authors to put their preprints on arXiv.org before submitting, but that’s just to ensure that every researcher worldwide is immediately aware of their existence. SciPost independently hosts all refereeing processes and curates all published content on its own site, like other professional-caliber publishing entity, and is thus not an overlay. SciPost would thus be better described as a Platinum/Palladium, 24k publisher (see my blog post), namely something that goes even beyond Gold, and would better fit in a leftmost column (with a kind of purple-like metallic platinum/palladium sheen as color, at least if you’re into traditional photography (smiley)). Just a couple of points on your option G; 1) You say you are “unsure” if it is compliant, but Robert-Jan Smits has confirmed on a number of occasions that it will be compliant (including publicly at the OASPA conference in Vienna); 2) effect on publishers will be to reduce APC income in hybrid journals (as no APC will be paid); 3) conversely, there will be a saving for funders for the same reason. Thank you for this overview! I wonder if transformation contracts (like “Read & Publish” from RSC http://www.rsc.org/journals-books-databases/open-access/ or offsetting contracts) count as hybrid or not and are possible routes towards compliance? Thanks for this useful overview. In row “10. overall pub cost”, what does “depends on cap” mean? Do you mean cap on APC? If so, I don’t understand why routes B and E should depend on cap. They are both non-APC.